Now we’re ready to create the VM. Open VirtualBox and click at the ‘New’ button. The wizard which will guide you trough the configuration of the VM will open. Select ‘Linux’ as type, ‘Linux 2.6 (64-bit)’ as version and click ‘Next’. Choose an amount of RAM memory for the VM (minimal 512MB, I’m using 2048MB, the same minimum amount of the DS3612xs) and click ‘Next’. In the next step we need to create a new virtual disk, this disk will represent the usable storage for your media and the Synology DSM operating system. Choose your favorite type of disk. Choose for ‘Dynamically allocated’ (Thin provisioned) or ‘Fixed size’. 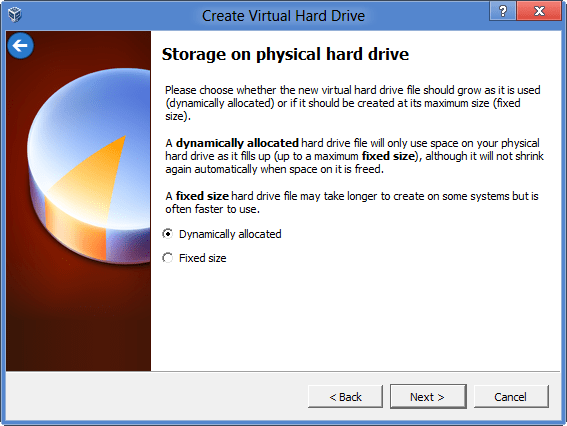 Select a location, name and size for the disk and click ‘Create’ to create the VM and virtual harddisk. 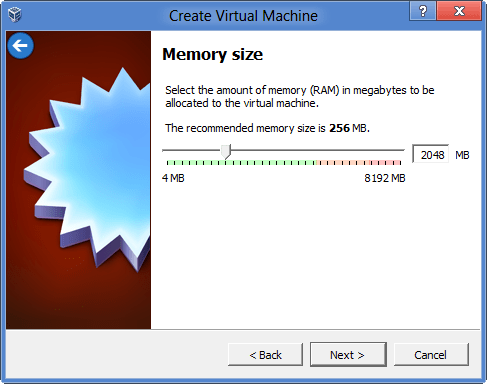 Now we’ve created the VM it’s time to change some settings, select the VM in VirtualBox and click ‘Settings’. 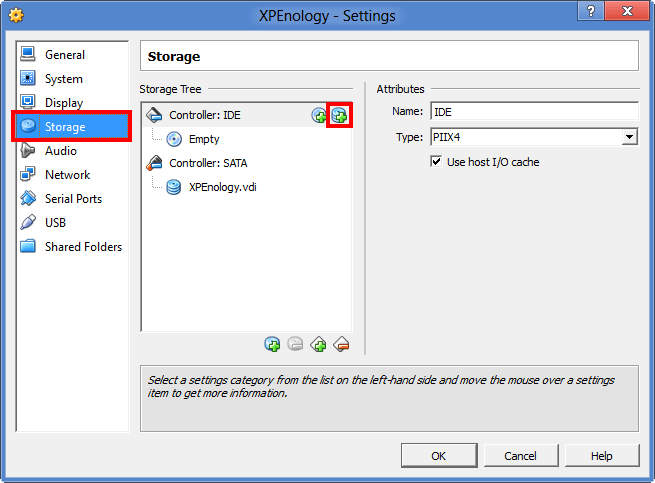 Select ‘Storage’ and click the button next to ‘Controller IDE’ to add the XPEnology boot disk. Browse to and open the SynoBoot virtual disk. Finally we need to alter the networking configuration. Click on ‘Network’ and set the adapter to ‘Bridged Adapter’. 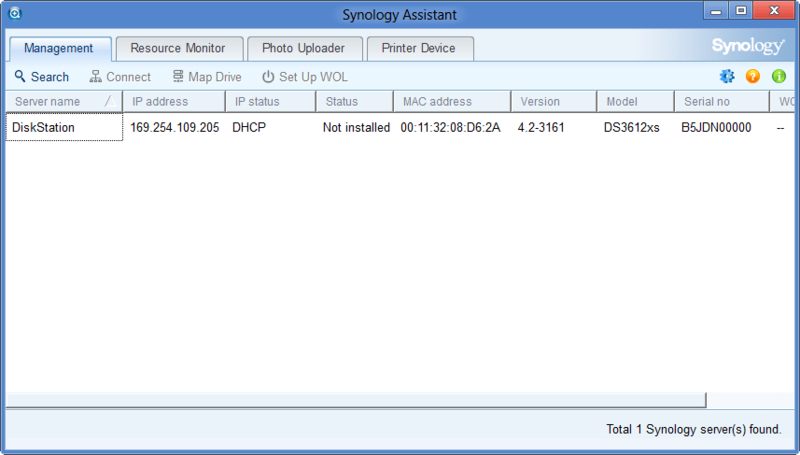 Change the ‘MAC Address’ to 00113208D62A, this is necessary for DS Assistant to detect the VM as Synology hardware. After you’ve changed the settings click ‘OK’. The configuration part of the VM is now completed. The VM is now ready for DSM installation. 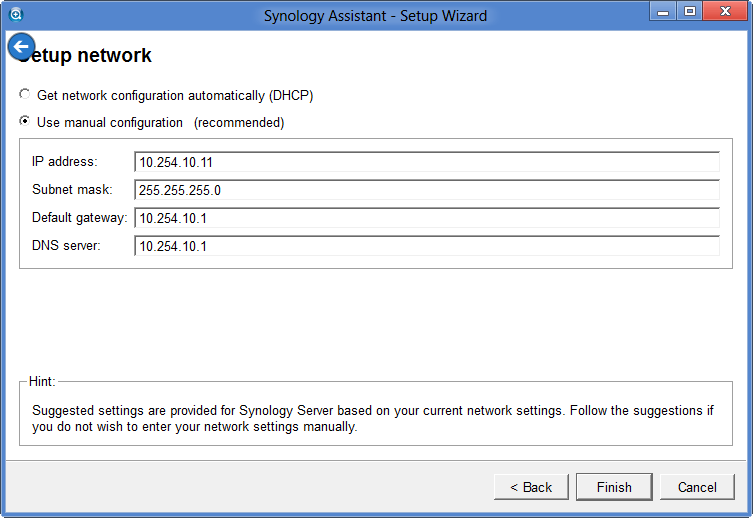 For the installation process we use the Synology DS Assistant (the same way you would if you’ve to install a regular Disk Station). Download DS Assistant from the Synology Download Center (choose a random model, the DS Assistant is the same for all models). Before we can detect and install DSM we have to power on the VM. 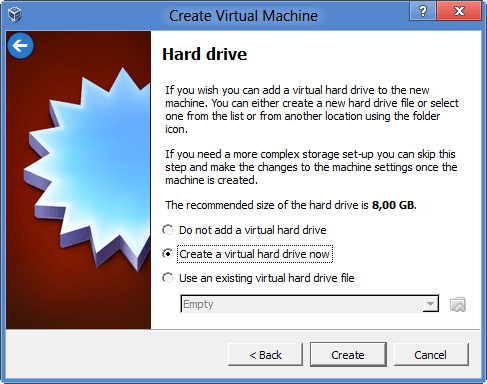 Select the VM in VirtualBox and click ‘Start’. The VM is ready when you see ‘Booting the kernel.’. Now you’ve to start the DS Assistant application and if you’ve done everything right it should detect the VM as a Synology DS3612xs. 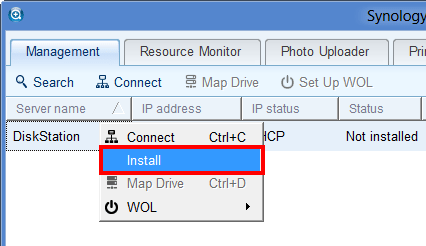 Now right-click the detected DiskStation and click ‘Install’. Select the .pat file from the XPEnology archive (don’t try an official Synology .pat file, it won’t work!) and click ‘Next’. 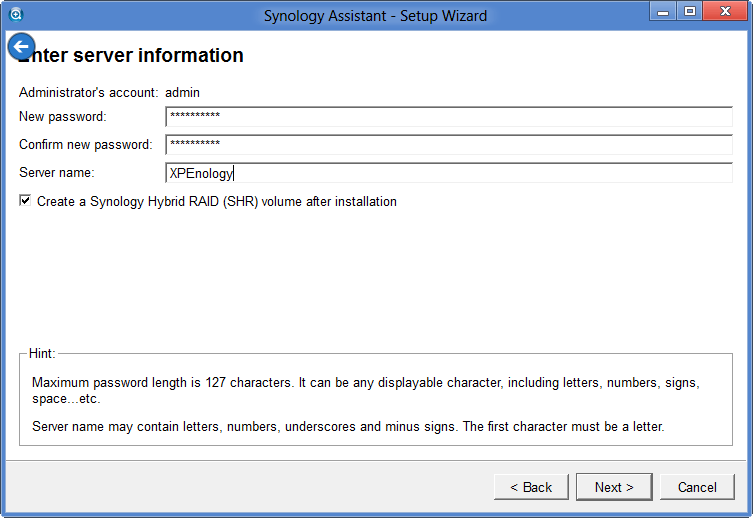 Enter a password for the admin user and provide a name for your XPEnology. Accept the warning by clicking ‘OK’. Enter the network settings and click ‘Finish’. Sit back while DSM is being installed. And a few minutes later the installation is completed. Open a webbrowser and browse to the ip-address you’ve configured in DS Assistant. Logon with the username ‘admin’ and the password you’ve chosen during the installation and hit ‘Enter’. Enjoy testing Synology DSM! 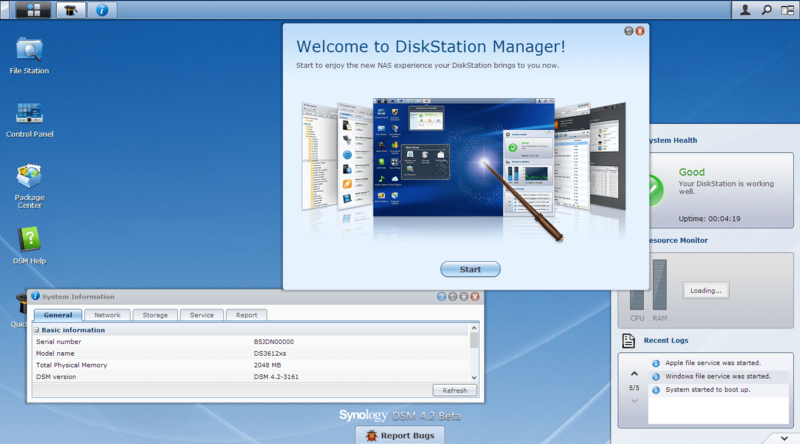 Please note, this is a fully working version of Synology Disk Station Manager but not usable for production purpose. If like DSM consider buying one of there products http://www.synology.com/products/index.php?lang=enu. Thank you for the great article and the immense effort in this. I am trying to cross-compile MPD (www.musicpd.org) from source for my Synology DS410 but so far, a big nothing. Could you be able to compile it for me? als ik eenmaal dsm wil installeren gaat er iets mis met de internet instellingen deze werken niet en er kan geen verbinding gemaakt worden. ik heb gewoon een willekeurig ip adres gekozen. wat kan er mis zijn??? Je mag je ip address settings niet veranderen bij het installeren, je moet het pas verander nadat je NAS geïnstalleerd is. Ik had ook dit probleem. Fired right up! No problems. Great instructions, thank you. BTW, do you know how the single MAC address will affect things? Such as everyone using the same MAC? Hello three, i have problem “No disk manage” for test packet on DSM.Can u help me for solve problem? -> i used vmware. 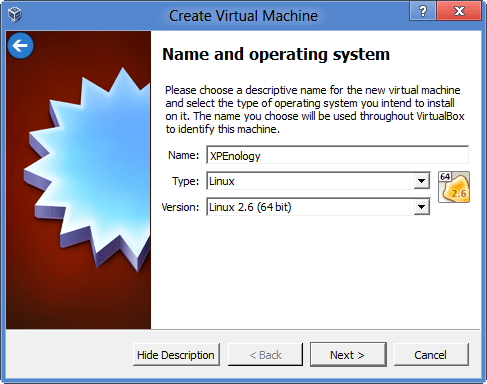 select “Linux 2.4 (64bit)” for the VM, and not “Linux 2.6” as shown in this tutorial. And yes, VT-x was activated in the BIOS. My solution: select “Linux 2.4 (64bit)” for the VM, and not “Linux 2.6” as shown in this tutorial. It magically solved the boot problem of XPE. Great summary of the work done at the website… I personally just followed the instructions above and had it up and running on my Mac Book with VirtualBox in a matter of minutes. This will be very handy for me as I’ll now create a Vagrant base box – http://www.vagrantup.com/ – to use for development purposes. I am having the same issue, and I can’t seem to get passed this. 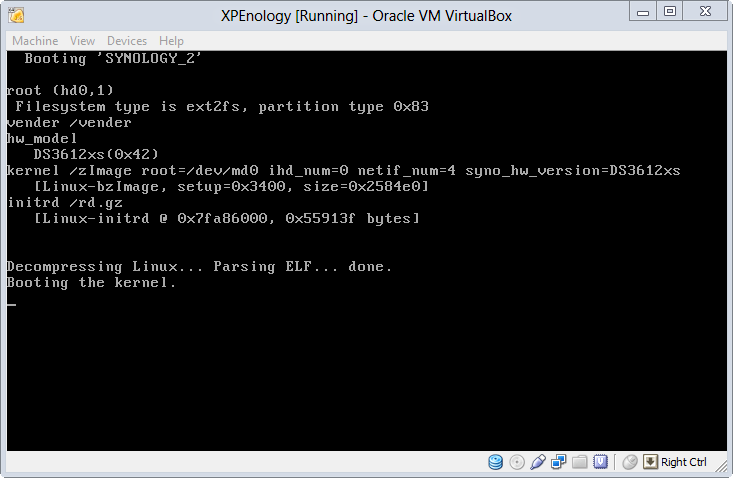 I dit it with the XPEnology_trantor_v1.2_DSM_DS3612xs_3211 package. Also thanks to microb because i have needed boath hints to solve problems. 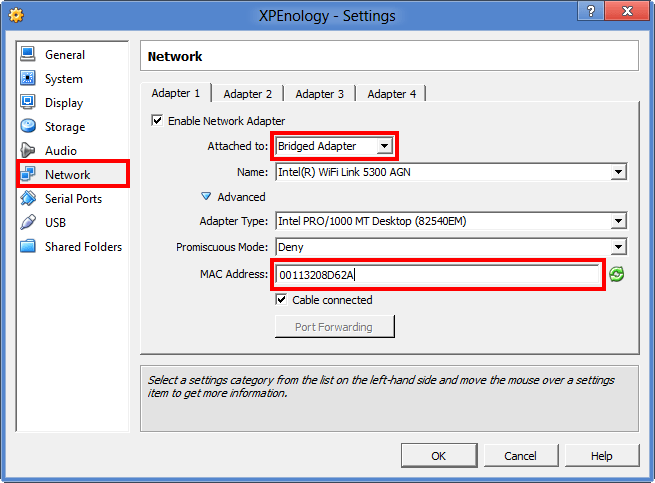 1) When you have issues with the DSM installation step (DSM install wizard says it cannot connect to the DS at the end of wizard step 1), make sure that the Macaddress in the VirtualBox VM’s network adapter matches the Mac address discovered by the synology assistent. If not, stop the VM and change the macaddress so that the addresses match and try again. 2) When you get a Grub error 22 during the first reboot after the DSM install, just restore/overwrite the boot-image disk with the image inside the downloaded archive. The boot image partition sometimes gets overwritten/deleted during DSM install. That did it for me. I have a working DSM virtual machine I can test with. Step 1 worked for me. Thank you. step 2. You need to add the boot image before you remove the old one in virtualbox. I started with both attached. Started the virtual pc Still got the grub message. Removed the original. Restarted and all I had to do was reconfigure the network settings. Thanks again for your advice. fantastisch , heb op lenovo desktop met i7 processor geinstalleerd met 2 x 2 terabyte.. werkt perfect en super snel…. Enter the network settings and………………………………………………….. NOT SO EASY….got stuck and didn´t connect……….. them,only them…….. click ‘Finish’. Wow! this is awesome. Thank you. Voor mij was de oplossing : Dar dit voor virtualbox een bekend probleem was !!! Start je computer en ga naar het BIOS screen en enable the virtualization voor je PC CPU. Hi, will it also run on my DS213+? can it be updated to 4.2 ? “This kernel requires an X86-64 CPU, but only detected an i686 CPU. Uanble to boot – please use a kernel appropriate for your CPU. Ik heb een C2D E7300 64 bits processor, Win7 64 bits geïnstalleerd en maak gebruik van Virtualbox. Ik heb de instructies opgevolgd, maar het lukt me niet om de machine aan de praat te krijgen. Wie kan mij in de juiste richting duwen voor de oplossing? I have same problem. Please help! can i install i freebsd or other os? Hi My computer dosnt support Viritualbox ( the bios on the main board) The CPU is 64bit but the problem is in the Bios, is there possible to install the Synology DSM on a PC a diferent way? with a Linux OS? Any guides on the internett? Toevallig ook een mogelijkheid om het op een fysieke machine te installeren anders dan op een standaard synology machine? Hello, my vbox says the cpu dosent supported 64bit. but it is a 64bit cpu. d2700 atom. is your OS 32bit or 64bit. i don’t know what the problem is but i had a problem on an other machine. If I am understanding the manual correctly, I need to be able to check the above option (hardware virtualization?) before I can run a 64 bit guest on a 32 bit host with this processor, and that by default it is disabled in the BIOS. My BIOS shows me no option to enable hardware virtualization or anything like that. I have the problem cpu of intel atom d2700. Host system is ubuntu 4/12 lts 64bit. I have read an another site that only the kernel runs with 64bit. Have anybody a 32bit kernel for xpnology? do you to mean this post? het is gelukt met de packages ik kan ze niet downloaden vanuit de nas, hij geeft dan aan dat de gebruikersnaam of ww niet klopt ik kan daarmee wel inloggen op de site. als ik ze handmatig download en installeer dan werkt het goed dus bedankt voor die info. weet iemand ook waarom ik in file station bij iedere map de melding krijg “bewerking mislukt”. Ik kan dus in de mappen geen bestanden zien, komt dit door de beta versie? bij gedeelde mappen staat verborgen niet aan. hoe staan de rechten op de mappen? zover ik kan zien gedeelde mappen op lezen/schrijven bij admin. Topper! BeautifulSoup graag op de NAS gehad, dus ipkg nodig. Maar net als jij geen zin om de productieversie te verkloten. Bedankt voor het online zetten! Je kunt packages testen van synology zelf of van bijvoorbeeld van de synocommunity. Je hebt geen serienummer nodig. Geweldig. Kan ik zaken testen, voordat ik in productie aan de slag ga. Ga deze week XBMC library op de NAS plaatsen. Ga zo door. Dank voor deze tip. Ga dit meteen morgen proberen.